Despite the many hazards, gas chlorine is still an established method for swimming pool chlorination. Chlorine gas is pulled from a pressurised cylinder under vacuum through supply lines. This is the safest way to feed gas chlorine, any break in the gas line results in a loss of vacuum instead of a dangerous pressurised gas leak. Vacuum is created by water passing through the injector nozzle. The design of which accelerates the water to create a venturi effect that pulls chlorine from the vacuum regulator. The regulator is typically mounted directly on a pressurised gas cylinder. Most installations use two cylinders, with an automatic switch over mechanism for uninterrupted gas supply. A two cylinder system can be set up with multiple flow meters (rotameters) to supply one or several pools from the single source. Note: The term ‘injector’ is used by some manufacturers, others use ‘ejector’. For simplicity we will use the ‘injector’ to cover all makes/models of gas chlorine injection products. A vacuum based feed system has the potential to pull chlorine when unintentional vacuum conditions are created in system plumbing. This siphoning effect is most likely to occur when the circulation system plumbing is above the pool water level. A loss of line pressure can result in the lines draining out to the pool (or open filter tank), and the action of this water ‘falling’ out of the pipes can create enough vacuum to pull chlorine gas from the regulator. This high rate dosing of chlorine without water flow is very dangerous; small basins of water can easily be over chlorinated or pure gas can end up in areas where staff and patrons are not expecting it. 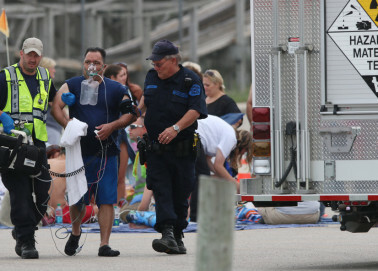 Alberta building code 7.2.3.42 requires anti siphon features on chemical dosing equipment installed above the swimming pool. We highly recommend that all swimming pool gas chlorine systems use ‘anti-siphon’ injectors. 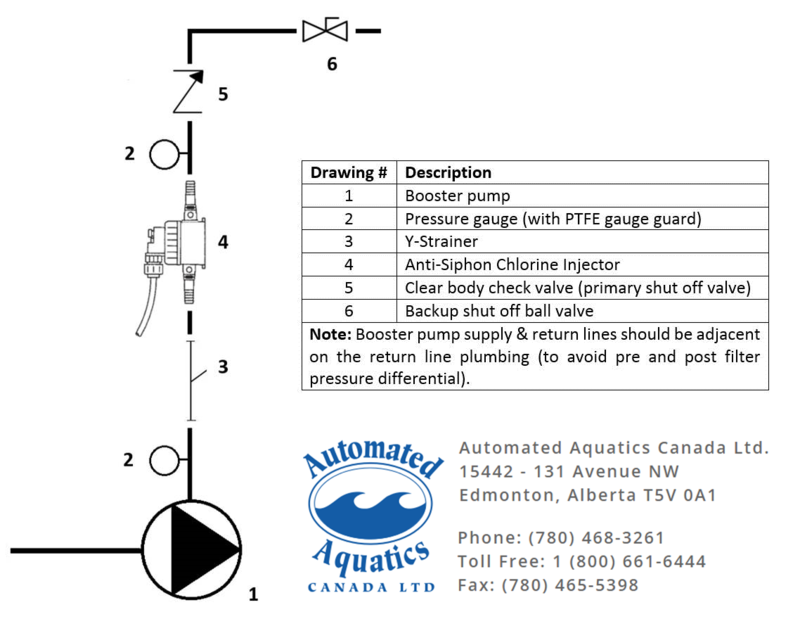 This feature on an injector means that a vacuum condition will only draw chlorine if there is the presence of water flow & pressure on the injector. Installations with the potential for extreme vacuum (>24” hg) may require an additional vacuum breaker on the plumbing system. 4)	Solenoid or booster pump control should prohibit rapid on/off cycling. Using both a solenoid and booster pump should be avoided.